Silvia Rizzo and Sal in their first competition together. 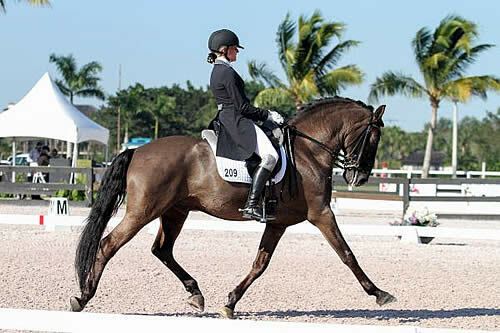 Wellington, FL – January 22, 2014 – Silvia Rizzo, the Italian dressage rider based in Germany, is back in South Florida for the second year of showing in the sun, this time with a brand new horse to ride. Sal, a 15-year-old Lusitano stallion whom Rizzo calls “Salame,” will be Rizzo’s partner in Grand Prix competition at Wellington’s top shows this season. Sal is an Alter Real bred and revised Pure Sangue Lusitano (PSL) (Mississippe x Maia X Agareno II). Just like Donnerbube 2, Rizzo’s ride during the 2013 winter season, Salame loves bananas. “I have another gorilla,” she laughed. Rizzo has been working with Sal for only three weeks, and part of that time was spent in transit as the pair traveled from Hof Marabunta, Rizzo’s farm in Germany, to their winter base in Wellington. Rizzo competed with Sal for the first time on Jan. 18 at the Gold Coast Opener national show, and she had plenty to smile her megawatt smile about after their first venture down centerline together. Although she was happy with her ride, Rizzo said she drove her partner and trainer, Michele Betti, crazy with her “blonde moments” at her first competition with Sal. The warm-up for their test was the first time Rizzo had ridden Sal with other horses, and she was happy with the way he handled it. Rizzo was also pleased with their score of 64.75 percent and is excited to keep improving as she and Sal get to know each other. Rizzo and Salame will surely attract a fan club during their time in Florida, just like she and Donnerbube 2 did last year. Rizzo said that the charter member of the Silvia and Salame fan club is her dachshund, Ziggy. While Rizzo and Salame are new dance partners, they are both seasoned competitors on the world stage. Sal has earned top placings in CDIs in some of Europe’s best venues, while Rizzo has ridden in major competitions around the globe, including invitational events such as the World Dressage Masters CDI5* Palm Beach and the Chi Al Shaqab festival’s CDI4* in Doha, Qatar. Rizzo and Sal will be back in action Jan. 23-24 at the Adequan Global Dressage Festival 3 CDI-W, where they will compete in the Grand Prix and Grand Prix Freestyle. They will debut their freestyle pattern set to energetic popular tunes, and afterward, Ziggy is sure to offer his unbiased opinion.